In a month she’d be homeless. Edna Williams-Foreman wasn’t sure why her landlords of 10 years called the meeting in October 1999. She and her 11 neighbors headed to the basement of their building at 54th and Woodlawn. Their landlords had an announcement: They were moving to Memphis, Tenn. But not to worry—they weren’t in a hurry. Before the building could be sold they had to complete at least six months’ worth of improvements to make the property more desirable. But, first, they were going to list it to test the market. That was Thursday. The property hit the market Friday. By Monday it was sold. Foreman, 43, a middle-class single mother, found a letter beneath her door the next week. The building was going condo and residents were not extended an option to buy. They had 30 days to get out. That began her complicated five-year journey toward home ownership—a trip that had seemed much simpler in theory. For years, Foreman, an African American, had set aside money, little by little, for building a down payment. Foreman’s challenges in getting a mortgage are familiar to many African Americans, who have the most difficulty securing home loans, according to a Chicago Reporter analysis of federal mortgage lending data. Blacks had better chances of getting home loans in Chicago in 1993—before the economic boom of the ’90s—than they did a decade later. In 1993, 72 percent of all applications from black home buyers resulted in loans, according to the Reporter’s analysis. In 2003, just 48 percent did. In comparison, nearly 76 percent of applications from whites in 2003 resulted in mortgages. “I think you do see institutions out there who do not lend to minority communities,” said Geoff Smith, project director of the Woodstock Institute, a nonprofit economic development organization that analyzes home mortgage lending data each year. The advocates’ observations are illustrated by 2003 federal mortgage lending data for individuals buying their homes in Chicago. According to the Reporter’s analysis, blacks were more likely than any other group to be denied by lenders, withdraw their applications, turn down approved loans and seek loans in predominantly black areas, which netted the lowest approval rates in Chicago. Blacks were also more likely to seek loans from subprime lenders, often mortgage companies offering home loans to people with poor credit, typically for more money in fees and interest. In many ways, the data do reflect how African Americans are playing catch-up in the home buying market, said Brian White, director for development and marketing at the Leadership Council for Metropolitan Open Communities, a nationally recognized fair housing group based in Chicago. More than 70 years ago, in an effort to spark home ownership during the Great Depression, the Federal Housing Administration began guaranteeing the full amount of home loans for high-risk borrowers. Such loans, known as FHA loans, allowed borrowers to put less money down and pay off loans sooner without penalty. In 1944, the U.S. Veterans Administration established similar loans—VA loans—that required nothing down and negotiable finance rates for veterans returning home from World War II. But restrictions on the FHA loans gave preference to those moving to newer communities, often suburbs. As a result, banks were discouraged from extending the loans to urban neighborhoods that became increasingly African American. And many blacks who had served in the then-segregated military didn’t make enough money to afford homes, even with the help of VA loans, said White. These loans allowed many whites to create wealth for their heirs from the appreciation of their property, he said. Meanwhile, African Americans were left behind, and White said home ownership remains among the top indicators of wealth. With passage of the Fair Housing Act in 1968 and greater attention given to the government loans, lenders began steering minorities into FHA loans at higher rates than whites by the end of the 1970s and into the 1980s, White said. Edna Williams-Foreman and her husband separated after 14 years of marriage. Foreseeing the end, she began stashing away cash little by little when the problems in her marriage began to escalate. She wanted enough money to live on and eventually afford a house where she could finish raising their two school-aged children. But, with 13 credit cards—she was turned down for what would’ve been a 14th trying to buy paint at a local Ace Hardware store—a poor credit score and little real estate savvy, Foreman did not know how to get started or whether she’d qualify for a home loan. She hadn’t taken any classes on buying a home, but most homeowners she knew told her she needed to put down 20 percent. “I didn’t think I had enough money to go to a bank,” Foreman said. She tried anyhow and was rejected for a loan. Statistics show that African Americans were the most often denied for home loans in 2003—nearly 2.5 times the rate whites were rejected. And the gap has widened; in 1993, African Americans were denied 20 percent of the time, compared with 10 percent for whites. Foreman was not aware of her odds going in. She just knew that she wanted a house, so she was willing to make allowances and cut corners—including not hiring a realtor who could direct her to lenders and service providers. Once she settled into a new apartment, Foreman asked the owner for help finding a home. He recommended a mortgage broker, whose job is to bring a buyer and lender together for a fee, usually paid by the lender. Foreman’s broker put her in touch with Ameriquest Mortgage Company, a subprime lender that offered her a loan. She had often seen the company’s commercials on TV and believed that a company with that much exposure had to be reputable. Foreman met with the broker to discuss the good news. He said she would need two mortgages, since she was not putting enough money down. One mortgage, at a 7.69 percent interest rate, would cover 80 percent of the home price, and a second, at 12.66 percent, would cover the remainder. From the beginning, Foreman said, she felt the broker wasn’t giving her a thorough explanation of the process. She spent weeks agonizing over whether to accept the loan. She went online to find out more and learned that banks were offering interest rates in the 4 percent to 5 percent range. While afraid she wouldn’t get approved anywhere else if she did not take this loan, she could not bring herself to accept the terms. Once she gave in it was too late: Her loan application had expired and the lender would not reactivate it. Yet FitzGibbon said people aren’t relying on banks as much as they used to for mortgages. In the late ’80s, a majority of loans were provided through banks, as well as savings and loan institutions, he said, but today it’s through mortgage brokers and mortgage companies. Annually, the U.S. Department of Housing and Urban Development identifies a list of lenders who specialize in subprime lending, described by HUD as loans with higher costs and less favorable conditions. Many subprime lenders are mortgage companies, which are not as regulated as closely as banks. The Reporter’s analysis shows that subprime lenders doing business in Chicago granted nearly half of their home loans in predominately black census tracts. In addition, while 9 percent of loan applications from whites in Chicago were through subprime lenders, 40 percent of those from blacks were. Even African Americans earning more than $90,000 a year chose subprime lenders 40 percent of the time. 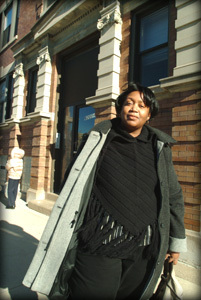 “Minorities who come in to get a loan tend to be steered to higher-cost loans though they may qualify for a better loan,” said Gail Parson, lead housing staff for the National Training and Information Center, often referred to as NTIC, which does research and community organizing in Chicago. Federal mortgage lending data has been public nationwide since the group helped pass the nation’s first Home Mortgage Disclosure Act in the mid-’70s. Parson hears complaints about subprime lenders who change the finance rate of a loan just before the buyer signs the final papers. Some feel pressured to sign anyhow, Parson said. The federal Truth In Lending Act, a law enacted in 1968 that requires lenders to disclose the true cost of loans and the actual interest rates and terms, should prevent such discrepancies. But it doesn’t, Parson said. Subprime lenders say that they serve a need by providing people with quick answers. “Brokers can track loans 24 hours—commitment issued within seconds,” said Michelle Homes, a spokesperson for MILA Inc. in Mountlake Terrace, Wash., one of the larger subprime lenders in the Chicago market. Howe added that 90 percent of the company’s business comes from mortgage brokers. Experts believe more African Americans are doing what Foreman did—getting approved for loans but walking away from them because they don’t agree with the terms. In 1993, 2 percent of African Americans who had been approved for loans turned them down, nearly the same rate as whites. A decade later that number jumped to 23 percent for African Americans and 8 percent for whites. Experts agree that home buyer education classes improve a person’s chances of getting a good mortgage and keeping it. People who receive homeownership counseling are 26 percent less likely to become delinquent in their monthly mortgage payments, according to a May 2001 study by Freddie Mac, a mortgage company chartered by the federal government that encourages homeownership. The problem is that many home seekers do not do their research or take the classes. By the time home seekers approach lenders, they should have pulled together their down payments and reviewed their credit scores, Gardner said. These were steps Foreman had not yet taken. But, after things didn’t work out with her broker, she did more research. It turned out her credit scores were low—very low. Credit scores, compiled by three reporting agencies and commonly called FICO scores, can range from 300 to 850—with roughly 650 being the benchmark for good credit. Foreman’s score was 499. Eventually, while working as a receptionist at the University of Chicago, she heard about an employer-assisted housing program through which as many as 70 people could get counseling and money for down payments. At a presentation about the program, she met Lillie Jernigan, a consultant with Neighborhood Housing Services of Chicago, known as NHS, which provides lending and counseling services. “She said: ‘You need to let someone help you do this. You’re doing this the hard way,'” Foreman recalled. Jernigan suggested Foreman take NHS’ home ownership classes, where participants learn how to budget, research their credit, look for a house, and close the deal once they find one. The classes attract a range of participants. In mid-December, a class on “shopping for a home” brought more than 20 people to NHS’ central office in West Town, northwest of the Loop. The crowd included a woman in her 20s looking to land her first condo. She sat next to her mother, also in the market for her first home. Another woman, in blue scrubs sprinkled with the word “kitty,” was taking the classes for the second time. Later on, Jernigan introduced a game to test the students’ knowledge. Students were paired up and given an envelope containing 10 small sheets of papers with different sayings. They corresponded with pastel-colored sheets taped to the front wall, reading: “Close the loan,” “Make an offer,” and “Sign a contract.” Jernigan instructed the students to put the actions in order. Students worked together for roughly 10 minutes. It was clear that no one was certain that they had all the right answers. No one boasted of their success and, even as time expired, some continued second-guessing their decisions by swapping pieces of paper back and forth. The next night, in a class on “closing the deal” at NHS’ Roseland office, Valerie Jones, 68, by far the eldest student, took a seat near the front for the two-hour class. Jones was there looking for guidance in finding a single-level home where her husband could maneuver freely with his mobility aides. At 72, he can get down the 13 steps from the bedroom to the main floor of their South Side home, but he has little energy for the return trip. The couple, who paid off the mortgage on the house years ago, has found a buyer ready to take the property—for $93,000. Jones plans to use $40,000 of that money for a down payment on their new condo, and split $30,000 of it between two of their sons and save the remaining amount. Jernigan said that participants feel more empowered as they progress through the classes. Some show up with questions about investment properties. Experts say it’s that confidence that has catapulted whites to more approvals while the lack of it has prevented African Americans from demanding more competitive rates. For Foreman, building self-esteem financially meant addressing her poor credit history. With Jernigan’s help, Foreman learned how to draft a dispute letter to get changes made to her credit report. “Some of them clearly were my fault,” Foreman said, but creditors were willing to negotiate. The institution that serviced her $2,500 student loan agreed to a $100 payment each month to clear up the debt. She refinanced her car, saving an extra $120 a month. An Internet provider returned to Foreman one year’s worth of the company’s $10-a-month fees after finding out Foreman had never actually used the service. “A lot of times I got the balance [on credit cards] lowered—they would knock off the late fees,” Foreman said. She wrote 20 letters in all and was now paying off outdated bills, including a utility bill from years earlier that she didn’t know she had missed. Most credit scores fall in the 600s and 700s, according to Equifax, one of the credit reporting companies. Foreman’s score shot up from 499 to 655, and eventually to its current mark of 738, she said. Even the African American candidates with the best credit scores haven’t closed the racial gap. It is a matter of the neighborhood, sometimes. Believing he was the ideal candidate for a home loan, Urban Juncture’s Loyd did not think he’d have the kind of troubles that Foreman endured when he was trying to buy his second home in a predominantly black area on the city’s South Side. In 1993, the single 31-year-old lived in a 1,200-square-foot condominium in Lincoln Park. “I got tired of Lincoln Park,” said Loyd, who wanted to reconnect with African American culture. He had completed his bachelor’s and master’s degrees and his doctorate from the Massachusetts Institute of Technology, and he was making more than $100,000 annually as a consultant at McKinsey & Company Inc., a worldwide business consulting firm. Loyd was often out of town on business and mostly lived off an expense account. He didn’t own a car, so his largest expense was his mortgage. Over time, he accumulated $75,000 in savings. “From a balance sheet perspective, I was your best bet,” Loyd said. He began looking for properties, finally settling on a graystone with a coach home, together totaling 8,500 square feet, at 42nd Street and King Drive—and it was a good deal at $45,000. In its heyday, the early 20th century, the neighborhood housed the area’s wealthiest white owners of the stockyards a couple of miles west, Loyd said. Such a property was a risky investment and would be a tough case for any banker, he knew. But he thought an experienced loan officer would recognize that Loyd was assuming most of the risk. Yet when Loyd applied for a loan, he was assigned a novice who repeatedly conferred with his superior for guidance. The Reporter analysis shows that, during 2003, lenders were least likely to approve loan applications for properties in predominantly black areas. Applications from whites and Asians, which were widely successful in other communities, were accepted at lower rates in black communities. For some, such statistics are reminiscent of “redlining,” a term coined in the 1970s after a Chicago bank was found to have drawn a red line around neighborhoods where it would not lend. Others disagree. Advocates say that because of greater sophistication in credit scoring, lenders can easily explain denials as the results of higher credit risks. “And I think that gives lenders a justification for not lending to certain people,” said Smith of the Woodstock Institute. After six months, Loyd grew tired of waiting for an answer. He knew his credit scores were good and he had the money in hand even if they weren’t. He decided he’d had enough and began looking for another lender—results more common for those applying for home loans in pre-dominantly black areas than anywhere else. In 2003, people seeking loans in black areas were more than one-and-a-half times more likely to withdraw their applications than applicants in other areas. And those applying in black areas were more than two-and-a-half times more likely to walk away from approved loans than others. African Americans, no matter where they applied, were nearly twice as likely as whites to withdraw their home loan applications. Loyd, however, did not give up, though experts say many minority candidates would have. In early 1994 he applied for a loan at Illinois Service Federal, a small, black-owned neighborhood bank, and was approved in three weeks, but for just half of his request. He was forced to spend more than twice as much of his own money up front for the down payment. That left him with less money for the rehab, which took five years to complete. With her credit repaired, Foreman also felt confident. She decided to apply at her own bank, United Credit Union. But first, she requested a conference with the credit union’s president to discuss her application and explain all the work she had done to repair her credit. When they sat down last September, Foreman presented the letters she had written to creditors, receipts of bills she had paid off, photos of the condo she wanted and notes from the inspector. Foreman closed the deal on her home in October, getting a prime interest rate of 6.1 percent. She let out a scream when she signed the last piece of paperwork. “I needed that release,” she said. More than five years after Foreman began looking, she became the owner of a $155,000, three-bedroom, two-bathroom condominum at 62nd and Dorchester in Woodlawn. In December, she moved in. Liliana Ibara helped research this article.